On Thursday the 12th we'll be kicking off our Summer Movie Series with the incomparable Walt Disney classic, The Lion King! 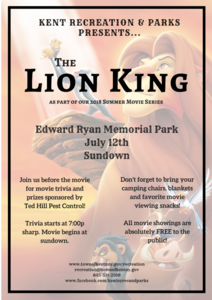 All showings take place at Edward Ryan Memorial Park, start at sundown(8:15ish) and are absolutely free to the public. Plus, for the third straight year we'll be doing pre-movie games with prizes sponsored by our friends at Ted Hill Pest Control! Games begin around 7:00p. Popcorn and/or snowcones will be served but don't forget to bring your own movie snacks as well as camping chairs, blankets and anything else you need to make your movie-going experience just right.